After a tough start playing shorthanded last week due to illness and injuries the Under 19s beat Grayslake yesterday 2-1. The player formally known as Theresa Tynski (it's an inside joke) scored and so did Mary Beth Chodl. Their next game is at home next Sunday against Lemont at 9:30am. Great job ladies! Last week this brand new team took it to Southern Select and beat them 9-0! This was an awesome game since for a lot of reasons. We're all excited about this team's future. Yesterday they had a bye, next week they play at home at 11:30 vs River Forest. The first week of the season the U-13s were off due to a bye. Yesterday they played Tinley Park at home. At half time we were winning 2-1, just as the second half began Tinley scored to tie it up at 2-2. I think this motivated our girls since we played about 80% of the rest of the game in front of their goal and wound up winning the game 6-2. The girls played a really good game and since I had spent so much money on the Under 9s and Under 12s at the Creamery on Saturday I promised to take them out for ice cream another day. I won't forget girls, honest. The 13s play away at Lincoln Way next Sunday at 2:00pm. Last Sunday the Under 12 Team started the season off playing the Darien Dynamo. We were up on them 2-0 when they scored to make it 2-1. We missed on a penalty kick after a hack in the box, but when it was their turn at taking a PK they scored tying the game 2-2. I then switched Jeremy Jones from defense to forward and immediately he dribbled through their team and scored a beautiful goal. This came after Jeremy had assisted on our first two goals, an awesome header by Ryan Utter and a perfect one time finesse shot from Brian "Tubby" Kane. Final score, No Limits 3 Dynamo 2. The bottom line in this game was that we played awesome soccer for 60 solid minutes. Thanks for a great game you guys. Yesterday we played against Illinois United a team from Tinley. After some interesting tactics before the game by the United coaching staff the game began. We followed up with the same high level and style of play from the week before and beat United 8-0. Yesterday the 12s played at Bolingbrook with Temo coaching. At halftime the score was tied at 0-0. In the second half Jeremy Jones scored three goals giving us a 3-0 win. The 12's play next Sunday at home against the Chicago Blast at 3:30pm. Thanks to Nick Kowalkowski, Brett Staehlin, Kyle Richmond and Shawn McGovern from the U-11s for helping us out. Lets keep playing like this you guys! This years team is a mix of players from different prior year's teams along with some new players to No Limits. Last Sunday the 11s played at home against the Hawks and beat them 8-0! I got to the game late after coaching the U-17s but what little I saw of the game was a pleasure to watch. Awesome game you guys! Yesterday Nick Morgan coached the 11s at Downers Grove and they lost 8-2. Next week the team plays on Saturday against the Lions at 1:00pm. Our brand spanking new Under 9 Team rocks! Returning players Patrick Kelly, PJ Kowalkowski and Clare Cable anchor this team this season and they're doing great. Last week against the Blazers, Zak Pavlovich scored and against Crossroads on Saturday, PJ Kowalkowski scored a great goal. Yesterday against the South Side Fire we lost 3-0 but Coach Nick Morgan said that the team is showing some significant progress. This team is so much fun to coach and train. This Friday these guys play USSA at Bradley. 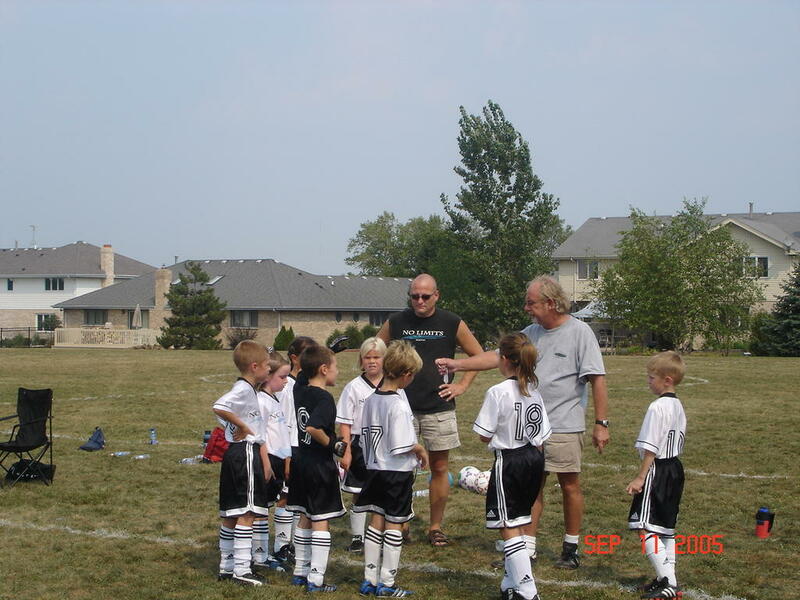 Here's a new photo from our 2005 Under 9 Team. Thanks to Mark Seper for sending this and other photos which you can see on our photo page here.